Following somebody on Twitter is always a small leap of faith. Sometimes it just doesn’t work out, for whatever reason. A couple of days ago I created an online poll to try to identify the common reasons for unfollowing people on Twitter. More than 500 votes have since been cast and as such we can now start to analyse the results. Based on the survey, it would appear as if the worst crime you can commit as a Twitter user is to be too noisy. This was the number one reason cited by respondents for clicking the ‘unfollow’ button. 52% of people said they had waved goodbye on this basis. In second place was too much self-promotion (48%), so shameless, narcissistic hawkers should keep an eye on their churn rate, if that kind of thing bothers them. Also scoring highly, in third place, were those guilty of posting too much spam (47%). At the other end of the scale, I often see people complaining about being fed up with ironic hashtags, but only 10% of people said this is a reason for unfollowing somebody. No longer involved with an organisation in real life. Not giving credit to sources. Feeds are fine if I have followed knowing that’s going to be the case. The poll remains live. You can click on the results, and then select ‘See All’ underneath ‘Other’ to see all 65 responses. A big thanks from me to everybody who took the poll. Digital marketing budgets in search engine and social media marketing are continuing to rise despite challenging economic conditions, according to research released today. 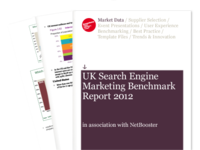 The UK Search Engine Benchmark Report, published in association with NetBooster, has for the past five years shown that companies have continuously invested in the opportunities present in SEO, paid search and social media marketing. The past several weeks haven’t been kind to Facebook. Its long-anticipated IPO was nothing short of a disaster, and since its public debut, the company’s stock has been battered. Clearly, finding investor friends on Wall Street hasn’t been an easy task for the world’s largest social network, and it may discover that finding retail friends on Main Street won’t be any easier after site outages last week left some ecommerce sites in a lurch.